Remember the amazing support network I keep talking about? Well they are at it again! On Sunday, April 3, 2011 a growing number of family and friends will be gathering in Lewiston, Minnesota to participate in the 33rd Annual Fool’s Five Road Race in my honor! The race proceeds benefit the Mayo Clinic, Gundersen Lutheran Foundation and the Lewiston Area Cancer Support Group. This is not the first time, however, that family members have participated in this race. Last year, my cousin Erica and her family participated in honor of Mike Trigg, husband of my cousin Jessi. Mike had recently been diagnosed with Non-Hodgekin’s Lymphoma and the family support system was ready to act. Mike has since won his battle with cancer (yay!) and this year, he and Jessi announced they were making the trip from Chicago to Lewiston for the race in order to pay it forward in my honor! How cool is that?!? Since then, I’ve learned of a number of other family and friends that will be joining. When I first caught wind of the race, I was uncertain if I’d be able to make it, not knowing what my docket of doctor’s appointments would look like. I recently learned however that I’ll be able to participate, as it falls nicely between my chemo appointments! Not only am I looking forward to participating with family and friends in this amazing cause, but it also is a great goal to work towards. I have to keep reminding myself though that registering for the race is one thing, but actually finishing the race is a whole other story! 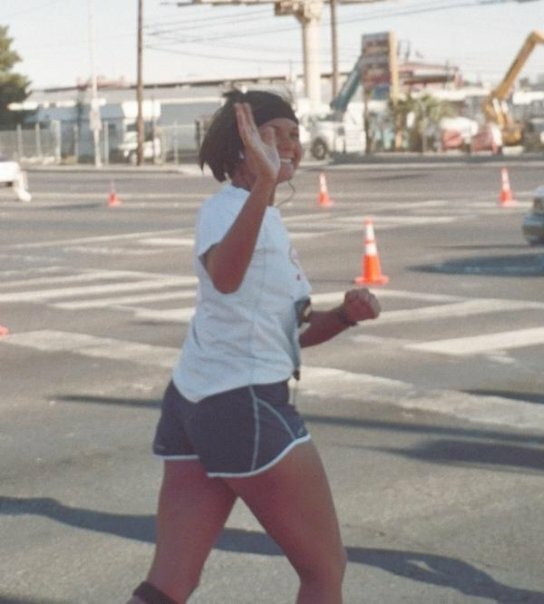 In my past (pre-cancer life), a 5 mile run was fairly regular accomplishment; in December, 2005 I ran the Las Vegas Marathon. However shortly after my cancer treatments began last summer, my exercise regimen quickly became non-existent once chemo fatigue set in and surgery followed. It’s time to reverse that, and the Fool’s Five race is the perfect catalyst to jump start a cautious training routine! Stay tuned for race updates, and if you are interested in joining us register today at http://www.foolsfive.org/. See you on Main Street! Wow, EM! Our family is SO proud to be walking to honor you, and well this news… there are no words to describe. We love you and can’t wait to see you next month! We are so honored to have you join us! I’m so choked up I don’t know what else to say. Time to ramp up our walks girl! So glad you guys are going back out for the race! Fools Five is so honored to be be the vessel that brings your family together on April 3 to embrace you in so many ways! This race is a very competitive race for those whose goal is to run their best time but uts true meaning is so much more than who crosses the finish line first. We’ll be there. I have never run 5 miles at 1 time but it is my goal to complete it even if I have to walk the last 4.75 miles ;-) Time to start training. Will be with you, EVERY step of the way!!! ROCK ON!!!! We’re coming too!!!! Won’t run, but will sure walk. Finally a group picture with you in it!!!! It was Great seeing you and Nick a couple weeks ago in Vegas. I’ve shipped my Headset to you and have just one thing to say, “Keep it above the Trees”…! Airplanes fly better above the trees…! EVEN GIVEN THE CIRCUMSTANCES, I’M SURE YOU WILL FINISH NEER FIRST. YOU’RE SUCH A CHAMP! I WOULD LOVE TO MAKE IT AS I KNOW THE FUN IT WILL BE IN THE PRESANCE OF YOUR FAM & FRIENDS; IT WILL BE NOTHING LESS THAN A BLAST. DESPITE THE FACT THAT MY OUT OF SHAPE LARGE MASS NEEDS A GOOD RUN, I WILL BE HERE IN TAHOE PROUDLY ROOTING YOU ON YOUR VALIANT RUN! I WOULD HOWEVER LIKE TO DONATE TO YOUR CAUSE. IF I CAN’T BE THERE IN BODY, I HOPE YOU’LL ACCEPT SPIRIT. SO IF I MAY, LET ME KNOW WHERE TO SEND THE CHEDDER. Hi Em! Dustin, Carson and I just signed up for the race. See you on main street!